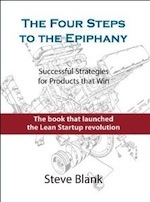 Here is an impression I am getting from many of the start-ups back East: The lean start-up processes that many follow believe they will be on an “auto-pilot to success” if he program is followed…meaning once they build their “MVP” and are ready to launch, all they need to do next is put up a “PRICING & PLANS” section on their website, install the latest sales/marketing 2.0 tools, and they will be off to the races. (Both lean start-up principles and web 2.0 tools are great…What I am saying is that a complementary, strategic, proactive approach in targeting ideal users, customers, and partners may be needed?) Some may argue that the “cost to acquire a customer” will be elevated, but if executed correctly, the ROI and swiftness to this approach can be huge. (THESE COMMENTS FAVOR B2B START-UPS VS. B2C.) Comment? By the way, you were a customer a few times as I was with Sandy at ASK Computer Systems from 1982-1989…glad she had some influence on you when you were coming up with your pricing model!.. (funny article you wrote about this a while ago). Great to see she is back at it with http://www.kenandy.com. This is a freakishly awesome blog post. After running my own company for two years I can totally relate to having “steel in your eyes”! I love it. I would add step 4.5. Make sure the company did well, by some measure. Don’t bring them back on as partner after watching them bellyflop. Having done a bit of start-up work I certainly know what this post is about but I wonder whether good VCs would make good start-up CEOs. Rather than have potential VCs do their own start-up why not have them embed themselves in a start-up (or maybe more than one), like war correspondents? Maybe that would be a simpler alternative. Steve – Am I missing your point ? Awesome post, Steve. Definitely plenty of examples of junior VC’s going into operating roles and then back to firms, but few of making the leap to CEO and then back into VC. Re: the war correspondent idea, I could see how the VC firm would benefit but not sure the company would. I think you can invest in a company or operate a company, but not both at the same time. Blurring the lines would likely be detrimental to both parties. Alex – the point is, that being embedded is very different from being the guy responsible. It’s not the same. Getting any experience in a startup is great, but confusing it with being the CEO is a mistake. Totally agree with you Steve. Been there, done that. Embedded vs founder/CEO: great learning experience, no comparison what so ever. This would be like an apprenticeship….where partners actually had the insight and experience to make the calls….great idea. Reminds me of the CIA story, if you want real intelligence you have go live there and in the places we need intel., it probably mean dysentery and less than comfortable surroundings. I’m wondering if you can spot the VC’s around the boardroom table or in a fund-raising interview who have actually been there and sweated the startup life vs. those with operating experience. It would make an interesting case study. I think what we really need is to bring the entrepreneurial process into the 21st century or even the 20th. Just like we have specialization of labor on assembly lines or any business process, we should effectively structure the entrepreneurial endeavor. We need to recognize that the person with the creativity and intellect or shear luck to come up with a great new product or service may not be the person who is best suited to bring it to market. This doesn’t necessarily mean we need to sign them up for a bunch of classes, it means we need to find someone with the proper skill set to launch the company. This could mean redefining the word “entrepreneur” from “a person that had a great idea and made a company” to “a person that takes great ideas and brings them to market”. We would then likely further specialize the field to “seed stage entrepreneur” or “first round entrepreneur”, etc. Perhaps it’s only when travel down this road a bit will we truly realize the potential of capitalism. I think one way to take a step in this direction is creating a VC investment tax policy where every individual is motivated to invest a portion of income in approved VC firms. Approved VC firms would then invest those funds in a timely manner in high-risk, high-reward start-ups. This investment mandate would bring the innovative potential of large open markets to the entrepreneurial process itself. You could say that today, not only must an entrepreneur invent a great product or service, they must reinvent the wheel of bringing a product to market. Thanks Steve! From my own experience there is no better way to learn than by doing. I would love to work with an investor that had actually been there and done it! Steve, I agree in principle with I would extend the timing of your 1..5 to several year stints. I don’t think you can credibly be a Partner at a firm and lead investments, take board seats, etc. before you have gotten to 10/15 years of operating/investing experience. And even then, it takes 10 years of screwing around to start knowing what the hell you are doing ;-). Jeff, when does your program start! A successful entrepreneur is self-motivated and driven from within to do everything possible to make the company a success. He isn’t treating the company as a training ground. You just aren’t as serious when you’re playing with the house’s money. Saying it would be great to get more startup CEO experience into a VC firm is spot on. But I don’t think this is a realistic path – there’s just such a huge difference between leading a company you are passionate about building into something great and leading a company that’s basically a toy/model/project/summer camp experience for your college application/VC career path. And I think you’d be getting a lot more of the latter, especially when you emphasize how cheap it is to play around – $500k and 6 months. Being a startup CEO isn’t backpacking through europe or taking what the British call a gap year before Uni. And having a CEO whose there to get experience in the field to take back to their real life is a terrible disservice to everyone else working hard to build a company as their absolute first priority. I totally agree that this kind of experience would benefit a VC firm. But the way to get it is to simply adopt the attitude that it is valuable and then seek out those people with such experience – you can’t swing a dead cat in the valley without hitting one of them. The filter for the ones that can be groomed with the other requisite VC qualities and temperaments. That’s a lot more straightforward too. I totally agree, but said it much less eloquently in my own post. Clever post. There are few things more maddening in life than being rejected by a VC who has NOT “been there, done that” (and has the scar tissue to prove it), but rather, s/he got into the venture game via the low-risk i-banking or consulting route or by working the HBS or GSB network hard. If being a startup CEO became the established career path, it might help on the empathy front, if nothing else. However, my suspicion is that, as you mention, it might not really matter. As the number of deals per partner increase (a trend that is partly driven by how cheap it is to start & fund a company), the VC job really becomes that of a being stock picker vs. company builder. The job also becomes a marketing role– witness the handful of celebrity VCs that have become a “magnet” for top deals based on their active blogging. Since the ultimate responsibility is to generate a profit for their LPs, being a startup CEO probably doesn’t matter for these guys either. Still, it would be cool…. Forgive my ignorance because I raised the money for my company through friends and family. But as far as VCs … aren’t they already past CEOs? How could they not be? They come from a variety of backgrounds. I would wager the majority are MBA’s and finance people. 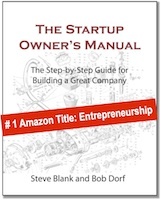 Few have been operating executives, very few startup CEO’s. A most interesting concept, however as I review the background training of most vc’s and fellow board members and as you point out in your response to Cynthia Wylie…..very few vc’s have actual CEO experience. It is a thoughtful premise, but I would wager that the majority of venture partners, at a Monday meeting, if asked which of their fellow colleagues around the conference table, would they appoint CEO of one of their portfolio start-ups…it would be a distinct minority. This process makes great sense on paper, but my guess is it would not deliver even 50% of what you want. Just going thru the motions won’t get you there no more than baby-sitting prepares you for motherhood. You see, the entrepreneur really knows they are going to be evicted, lose every damn thing they have, families breakup, etc. Also they believe in the venture from the gut out, which justifies the risk in their head. But this “run a company sabbatical” thingy has none of those real-life consequences. Whatever lessons learned are virtually useless, especially if they succeed! I suggest reading 50% more case studies, interview 50% more people than normal for funding just to learn something that’s real to the VC associate. Maybe the VC firm should make it a policy that associates interview every person who submits a plan (that would actually be good for everybody, really). In other words, put steel in your work ethic and your eyes will learn to see the best deals. Work your tail off to become a damn good VC, or anything else. “Entrepreneur for a day” is not a shortcut, IMHO. A great idea that will never be implemented. Where does the motivation or incentive for creating these types of experienced partners come from? The incentives are in fact pointed in the opposite direction, unfortunately. I have never seen a VC who would be capable of running a company successfully. Putting a VC as CEO would fatten up some portfolios in the short term, I bet. But in the end it would just be yet another bubble that will eventually pop and leave most people broke. I have always been a coach and mentor to CEOs. But I have been the exception. Most VCs either purposefully or because they can’t help themselves almost always become adversarial to the CEO’s. And I find myself on the other side of the table from them. Maybe that dynamic tension is good in some ways. But it is usually very destructive and wastes time for the CEO. I don’t see most VC firms wanting this skill set on their staffs. They just want to make money – doesn’t matter how. I love the post Steve, since it’s an issue I have often considered over 13 years of starting & running VC-backed ventures. However, contrary to conventional wisdom, I don’t think there is evidence that ex-entrepreneurs necessarily make better VCs. The best VC, in my opinion, is one who is making a lot of money for their investors, and therefore can stand by their portfolio companies with conviction– and attract other investors and partners by their reputation. It’s not the partner who is most empathetic or who can identify with your CEO woes. A quick look at the “Midas List” seems to indicate that attendance at Harvard or Stanford Business Schools is better correlated with VC success than having started and run a venture. Could be – but I kind of wonder where Marc andreessen and Vinod Khosla would be without founder/CEO experience? Doesn’t it seem somewhat insane to say that, as a VC, you search for the right kind of founders to give money to, yet to turn around and hand $500k to one of your VCs in training to go found a company? I have the utmost respect for Steve Blank and for you Fred, but this seems a bizarre dichotomy. The corollary might be, let’s fill the VC ranks with former startup CEOs – which i don’t think would be a good idea, or lets fill the startup CEO ranks with budding VCs. I think the point that is being made is that it is difficult for a VC to empathise with a CEO and thus to provide personal guidance or to really understand the challenges of the business (short- or long-term). This is certainly a drawback. To send a budding VC into the “wilderness” as a coming of age just doesn’t seem to be the right use of $500k. I think it is a different matter to accept into the VC firm those that have, on their own, survived the wilderness. These might be the candidates you seek for the role. What about a “simulated” venture, so that the VC can get some of the experiences without incurring the costs and ancillary difficulties? I’m not sure if the current state of biz simulation tools are any good, but the goal would be to address: “Further, they’d experience first hand how, in a startup, the devil is in the details of execution and deliverables”. In terms of the people part, a simulation is useless, but, perhaps that is that something that the budding VC could experience in some other way. I dont think a simulator can replicate the thrill of very really firing two of your best friend founders, being three days from a zero account balance, begging your lead investor for an emergency bridge round, getting diluted in the process while you belly up to the bar for a fresh round of personal loans and guarantees, slerping well after finding out that people you trusted were stealing and plotting against you, having said friends own a piece of the company sadly ever after, not having customers return your phone calls or being sadled with a half a million dollars worth of capital equipment or code you cant use because your founder buddies and lead engineers were in fact, idiots. Or jumping for joy when a customer finally agrees to meet you again. That is where the steel comes from. All good points, truly! But if the very things simulation won’t address are the very things that provide the “steel”, that tempering of the will that only comes through experience, then Steve’s original suggestion suffers the same shortcoming–because it is still an artificial experience. Thinking that he was looking for alternatives to the artificial experience he wished to provide, my mind ventured to NASA space training programs–which are all simulations. I have no objection to the premise that only folks with prior, real experience as entrepreneurs should be VCs, if it is only through that experience that VCs can empathize with an entrepreneur in the course of discharging their responsibility. That is what I hear you saying needs to be the case. Great post, but I’m not sure that becoming a VC is a grooming process. The VC wannabe would want to be one on their own, whether their route is via operational experience or startups scars. I am with COinTO: teachers do not need to have ‘done it’ in order to be good teachers. All too often if you get someone who has ‘been a CEO’ they will very often fall back into the ‘this is how we did it’ and innovation (of management) will be lost. It is bad enough that VCs look for ‘past startup experience’, thus limiting their options. What VCs should do is micro-finance, dole out smaller amounts towards the funding needs, after establishing broad but relevant guidelines. All too many VCs are hung up on semantics these days: the lingo needs to be democraticized so that founders do not need to talk the VC’s language; it should be the other way around. Although I applaud giving armchair VCs a taste of what it’s really like to run a startup, I think it will only give you half of what you want: A truly good VC. Where it might help: Gives VCs real personal experience of the challenges in running a startup: not enough time, money or people and yet having to operate successfully. Presumably, this will make VC’s “advice” and “value add” true to life. Well, hopefully. Where it won’t help: Make a better investor. Unfortunately operating experiences in startups are not really generalizable — despite the view of management consultants. They are highly specific to the market opportunity, the technology, the people, with all their quirks and charms. There are few really good VCs: i.e. someone who can grow a major company from a seed opportunity. Only Art Rock comes to mind and he’d admit that he’d make a really lousy manager. How does taking a year off and burning through money teach you anything? Basic accounting — when the money’s all spent, there is none left. That’s a pretty low barrier, but probably necessary for VCs. But of course, this lesson, like any other, isn’t really learned. Not if the the person “playing CEO” for a year isn’t spending their own money, and risking their own future. If it’s just a game to try and establish your own credibility in your own eyes (so that you can think you have “steel in your eyes” — whatever that crap is supposed to mean), then go ahead and do it. Play bo-peep for a while and come back and spend someone else’s money with the rest of the herd. Or, how about only bringing on partners who’ve proven they’re CEO material because they’ve started their own companies, from bootstrap through profitability to expansion and sustainability. And let them bring their own money. This is what venture capitalists used to be. Talented engineers who became successful entrepreneurs and risked their own money and staked their own reputation on their investments. Not MBAs with a silver spoon and the “Romney look” gambling with a never ending supply of monopoly money. Steve – I love the creativity and the thought provoking approach to address a short coming I see in the VC model. I’d love to see it put into practice in a very pubic way (Start-up Genome style analysis?) but I think the program fails in the end. The 1 year CEO rotation sounds more like a boot camp simulation than an authentic start-up experience. The closed end nature of the CEO role is a big limiter. Will the temporary CEO really feel the pressure to succeed and to do whatever it takes to pivot and find a path to success? Or will she/he start a 365 day countdown to the next (waiting) job back at the firm? And what if the start-up succeeds? Why would somebody who delivers that success not want to be the CEO of something he/she started? Even with these short-comings, I put this approach into the category of “something is better than nothing” and would love to see a firm give this a go. Actually a partner of a major West Coast VC is doing just that. He’s not ready to talk about it, but boy has he learned a lot. Steve, Great post. I couldn’t agree more. I will second your motion. I know lots of VCs and most are great people with reasonable skills that you mentioned but at the end of the day until you have been there done that you don’t really have a clue. Even after five start-up experiences I find myself surprised and amazed by how little I sometimes know. Despite most of the comments I think the experience would enhance the VCs ability to be an effective contributor to those he ultimately funds. Great thinking. Some VCs/Investors were entrepreneurs and built companies – and even industries.. and from my limited experience pitching they are the best. I met with Ori Sasson and can tell you his depth of understanding, after starting a whole industry, wasn’t even on the same scale as pattern matching, hand wringing timid sheep type attitude that dominates the old boys network that is VC investing. They want a safe investment that all their friends are in on – where is the venture part? Incubators and early stage angels take most of the risks these day. Tons of Angels have that experience building companies, as long as they built the company, and were not just some mid level manager who lucked out with stock options, they can provide a ton of value. I love the idea of turning the tables on VCs, but I’d say this: 1 one year play at starting a company with funding is not even remotely realistic enough to have them understand what a entrepreneur goes through. If you don’t feel like you are betting *everything*, that you are willing to die trying to get your company going, that you won’t give up in 1 year, 10 years, or ever, you aren’t a entrepreneur. So, VCs who haven’t *really* started a company, and made it successful, can’t buy there way in my opinion. Charles – is it better than nothing or not worth doing? Well, I could see it working for really forward looking firms, who are basically willing to let their associates go, I don’t think they could guarantee they will come back if successful or want them back if not. And as long as the funding wasn’t guaranteed – it wold require a authentic pitch, with the possibility of being rejected, they would learn a ton from that. So, worth doing for those bold enough, can’t imagine it becoming a big trend, folks don’t get into finance industry and go back to ramen living often. No doubt the VC industry has become bloated – far too many firms, too much money raised, requiring too much to be spent too soon, mostly by investors with only a financial (if that) background. That said, a good entrepreneur isn’t necessarily a good investor, as the skills and perspectives are different. Great investors are those that ultimately respect, and appreciate, the hardest job of all – entrepreneur. I wonder are great investors those that respect and appreciate the entrepreneur or those who return the biggest pile of cash to their limited partners? Maybe those who do the later while accomplishing the former. Being “the boss” (I.e. the CEO) who must actually serve “the bosses” (i.e. the board) is the ultimate crucible. Sound premise. Excellent article. 1) Nothing in life teaches you more than running a business. 2) It takes a hell of a lot longer than 1 year to absorb a majority of the lessons. It’s hard for me to imagine someone reaping the full benefits (ie living the stress of a struggling business being your everything) of running a business when they know it’s a short term project. Still seems like a good idea though. On a personal level, I love virtually anyone who has ever started/run a business, and I guess I’d like it in a VC I had to deal with too. Certainly a VC having operating experience as a startup CEO is perhaps better than having none. But I think it really depends on the person and whether he get actually learn anything useful from it. There’s a major VC who founded and was CEO of a startup. It was kind of a dud as it was sold for less than what was invested. Then he goes on to found a major VC firm. From that perch, he was the lead investor in two of the largest VC bankruptcies in the history of VC financings. And no it wasn’t a dotcom so I’ll leave it up to your imagination. Hint: think clean. You forgot to mention that vc’s also have a heart of stone! Outstanding insight, as ever Steve. With everything that is going on in the world right now, it’s taking every ounce of sanity and courage for insightful entrepreneurs to maintain their course. The worst thing for an entrepreneur right now is dealing with a VC who doesn’t have the relevant hands-on experience and hardship to go with it. Statistical evidence shows this to be true as well. As a member of the special operations community interested in topics related to leadership, strategy, and innovation, I really enjoyed your post. As I’m sure you know from your own experience, many of the qualities you hit on (relentless, focused, team oriented, passion to win, refusal to quit) are also promoted within the culture of the military… although the learning process obviously takes place in a radically different environment with different consequences. I’m sure the similarities between the two worlds don’t end there, however. I’ve just started my personal blog, in which I intend to share lessons learned from more than a decade of conducting high-risk counter-terrorism missions across the world. My specific focus will be on leadership, team work, personal relationships, strategic thinking, and creative problem solving. I expanded a bit on your thoughts in my most recent post (http://blackopsfile.com) and hope you and others take the time read and comment on them. There would be a lot fewer dot-bombs if more venture capitalists took your advice and learned how to run a company before investing in them. It is very hard to advise someone on something you don’t know how to do yourself. > It is very hard to advise someone on something you don’t know how to do yourself. I’ve always found it much easier 😉 ! And that is a big part of the problem. Have been through three successful software start-ups here in Austin, the last of which IPO’d ‘back in the day’ and provided me with enough capital to assess doing the VC thing, which I subsequently felt compelled to seriously consider for becoming my new day-job. Went to a *juried* set of pitches to a collection of true VCs at that time…and it was one & done for me. It was immediately apparent that I did not have the patience or interest in listening to one moronic, ill-conceived idea after the next in the hope of finding someone who had a clear vision for the market, was *capable* of running a start-up, much less actually had a great idea to fuel the requisite passion on the part of all parties. At a much more recent incubator-ish presentation at UT, the assertion was made that of 2,500 start-up solicitations only 25 would make it to a VC partners’ review, and of those only 2-3 would get funded. Many nodding VC heads in the crowd seemed to confirm this. My heart bounced with joy that I had not chosen the VC path. So count me as suspicious that the the most essential skill-set needed at a VC office, day-in and day-out, is comprised of (1) networking people skills, (2) truckloads of patience, (3) powerful intuition & listening skills, and (4) the uncompromising ability to shut down a dialogue — or cash flow — as soon as the “this is utterly bogus” alarm goes off. Spot on. How many times have we entrepreneurs walked out of a VC pitch wondering where the 20-something associate who just tried to re-write our business plan got his/her chops. I enjoyed your post, but don’t agree with your analysis. Receiving a zero risk venture backed entrepreneurship scholarship does not an entrepreneur make. I just watched the movie “Moneyball.” There is a scene in which a bunch of gray-haired baseball scouts are sitting around a conference table and trying to identify new talent for their roster. They spout subjective nonsense about “good-looking swings” and “natural talent” and the like. When Billy Beane/Brad Pitt starts talking about and relying on statistics, the old guard fights back and stresses the value of their years of experience and instincts, claiming that those intangibles are the essential aspects of finding real winners. Where’s the Bill James of venture? Startups don’t publish the reams of statistical information that baseball teams do, and VCs get vastly fewer “at bats” than ballplayers, but there has to be a way to bring some objectivity to the discussion. I like the idea of VCs really knowing what CEOs live through. I would hope it would make them more empathetic. But baseball GMs are judged by their win-loss records; so are VCs. 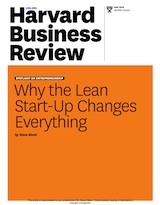 (Entrepreneurs have more nuanced criteria than team owners do; I assumed limiteds do not.) Do ex-CEO VCs have superior W-L records? There should be answers out there (“outside the building”…. ).